1. Go to Menu->Arrivals->Walk-Ins. The following screen will appear. 2. Determine if the customer is a NEW or EXISTING CLIENT. 1. Push the NEW button located at bottom, left-hand side of screen (about the fourth button from left). 2. A dialogue box will appear and ask if you wish to enter a NEW Client. Answer YES to continue with the new client. Answer NO to cancel this process an return to ARRIVALS. 3. Fill in each section of the new client form using the TAB or ENTER key to move from field to field. If a drop-down menu is available (such as for town), click on the small arrow and locate the correct town. Click on the town to highlight it into the box and use TAB or ENTER to move on to the next field. Phone number only uses 7 digit (local) numbers for home, work and other phones. You can enter comments, children, county, rank, chart #, codes, email and several dates. This form will automatically generate an account number and place today's date in the first visit and last visit fields. 4. Push the OK button located at the bottom, right-hand side of screen when finished entering the Client Information. A Referral Screen will now appear below the new client's record. 5. Enter the Client number of the referring person. To locate this number, press the LOCATE CLIENT REFERRAL in the center of the screen, this will bring up the list of all clients. Type in the Last Name to find the correct client. 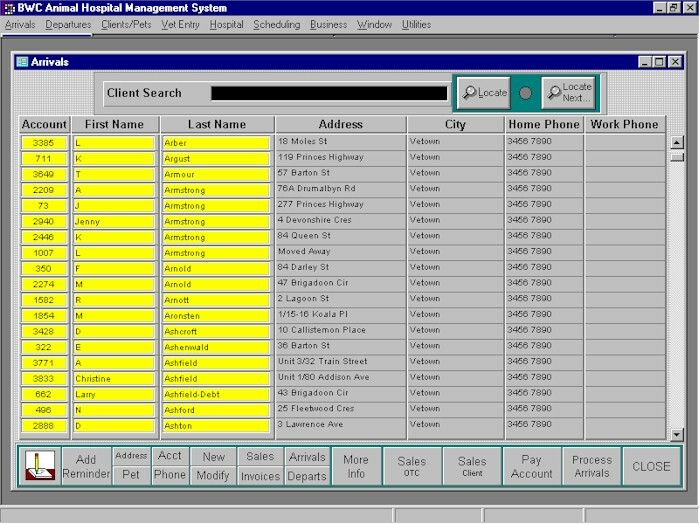 Click once on the highlighted name and the system will place this client's number in the referral field. If the client was NOT referred by a person affiliated with this office, TAB over to the Reference Field and enter the information (e.g. name of a person, newspaper, flyer, or other). Push OK button. 6. The Client & Animal Screen will appear. Use the menu buttons at the bottom of the screen to continue. You may MODIFY this new client's information or ADD ANIMAL to continue. From this screen you can also add vaccination information, tests, miscellaneous, history, pictures, objects, weight chart, feed guide, and owner info. Since this guide is explaining NEW PET's, we will just continue without completing other information. Push the OK button on the lower right. 4. You will return to the Client Animal Screen and the new pet's data is now visible on the new client's record. Push the CLOSE button when finished. You're going to want to use the CLIENT SEARCH to begin to locate a client. There are also various other ways to locate a particular pet or client. We've provided the various entries to locate a pet or client in the table which is visible below. 1. Search for the client using one of the search techniques from the Table. Type in the requested info (last name or phone or chart number, etc) in the space next to CLIENT SEARCH and press LOCATE. 2. Verify the client's first name and locate the appropriate client in the list. 3. Select the appropriate client by double clicking one of the yellow highlighted fields of the client. Search for a Client by entering the client's last name in the Client Search field and pressing the <Enter> key on your keyboard. The account number of the first client whose last name, or the beginning of whose last name, matches what was entered in the Client Search field will now be highlighted blue. Verify the correct spelling of the client's first and last name and locate them in the list. You can broaden or narrow your client search depending on exactly what is entered in the Client Search field. For instance, if you enter "s" (without the quotation marks), you will be taken to the first client whose last name begins with "s". Entering "sa" (again, without quotation marks) will take you to the first client whose last name begins with "sa", etc. You may also enter last name first name, without commas, (Example: smith john) to locate the first client in the list named John Smith. Double click on the desired client to view pet & preventative information. You may enter an account number in the Client Search field and press the <Enter> key on your keyboard to locate an exact account number match in the list. If the account number is found, the pet/preventative information will automatically be displayed. Another option is to search for a client by chart number. To do so, enter a plus sign (+) immediately followed by the chart number that you wish to locate in the Client Search field (Example: +1234), then push the <Enter> key . Leave no spaces between the plus sign and the chart number. The plus sign is required to distinguish a chart number from an account number. If the chart number is found, the pet/preventative information will automatically be displayed. You may enter a phone number (for example, for 659-0343, enter 6590343) in the Client Search field and press the <Enter> key on your keyboard to locate an exact home phone number match in the Clients. Remember to enter it as all numbers, without the area code, dash or spaces. If the phone number is found, the pet/preventative information will automatically be displayed. If multiple clients are found with the same home phone number, a form will appears showing the list. Highlight the desired client, and click OK.
You may enter an address (for example, for 777 Paddock Road, enter 777 pad) in the Client Search field and press the <Enter> key on your keyboard to locate all address matches in the Clients. Remember to enter it exactly, with just a portion, to broaden the search and compensate for various formats. If multiple clients are found with the same address, a form will appears showing the list. Highlight the desired client, and click OK.
To locate a client from the pet name, click on the PET button. A form appears with the list of all pets, sorted by Pet Name. Enter the desired pet name (or the beginning portion), and then press the <Enter> key. The form will highlight the first pet with the name. Double click on the desired pet, and the Client, Pet and preventative information will be displayed. Searches may also be performed by client address, client phone number, or pet name by pressing the appropriate button located at the bottom, left-hand side of the screen (Address, Phone, and Pet, respectively). 2. Double click in one of the yellow highlighted fields for the client. 3. Push the ADD PET button located at the bottom, left-hand side of the screen. 4. Enter information concerning the pet and push the OK button when finished. 5. Push the OK button again. 1. Search for the owner/client. 2. Select the appropriate client by double clicking on one of the yellow highlighted fields. 3. Select the correct pet by clicking on the name. Pet information will appear. 4. Determine the REASON FOR VISIT. 1. Push the SALES OTC button located at the bottom, middle of screen. 2. Push the NEW TRANSACTION button located at the bottom, left-hand side of screen. 3. Enter all relevant information. 4. Push the PROCESS or PROCESS RECEIPT (to print receipt, if desired) button (bottom, middle of screen). 5. Push the CLOSE button located at the bottom, right-hand side of screen when finished. 1. Search for and select the appropriate client by double clicking in a yellow highlighted field of the client. 2. Push the SALES CLIENT button located at the bottom, right-hand side of screen. 3. Push the YES button in the Counter Sales Attached To Client message box. 4. Enter relevant information in the Data Entry for Billables form. 5. Push the FINISH button located at the bottom, right-hand side of screen. 6. Enter relevant information in the Final Billing form. 2. Select the appropriate pet by single clicking in either the # or Pet Name field. 3. Push the SALES SINGLE button located at the bottom, right-hand side of screen. 5. Push the FINISH button and then enter relevant information in the Final Billing form. 6. Push the OK or OK RECEIPT (to print receipt, if desired) button. 2. Push the SALES MULTI button located at the bottom, right-hand side of screen. 3. Push the YES button in the Sales for Pets of Acct # XXXX message box. 4. Follow directions for selecting the appropriate pets that the sales are attached to. 5. Their names will appear in the Pets Selected for Arrivals list (bottom half of form). 6. Push the OK button. 7. The Data Entry for Billables form will appear for the first pet in the Pets Selected for Arrivals list. 8. Enter all information relevant to the sales for the particular pet and then push the FINISH button. 9. Another Data Entry for Billables form will appear for the next pet in the Pets Selected for Arrivals list. 10. Enter sales information for this particular pet and push the FINISH button. 11. Continue in this manner until all sales for all pets have been entered. 12. Push the FINISH button after entering the sales for the final pet in the Pets Selected for Arrivals list. 13. The Final Billing form will be displayed. 14. Enter relevant information in the Final Billing form. 15. Push the OK or OK RECEIPT (to print receipt, if desired) button. 1. Search for and select the appropriate client (double click in a yellow highlighted field of the client). 2. Push the PROCESS ARRIVALS button located at the bottom, right-hand side of screen. 3. Follow directions for selecting the appropriate pets that are arriving for treatment. 4. Their names will appear in the Pets Selected for Arrivals list (bottom half of form) . 5. Push the OK button. 6. Enter appropriate information in the Arrival Summary form. 7. Push the OK button located at the bottom, right-hand corner of the form. 8. An In-Patient Data form will now print. 2. Push the QUICK CONSULT button locate at the bottom, middle of the screen. 3. Push the YES button in the Quick Consult for Pets of Acct # XXXX message box. 4. Follow directions for selecting the appropriate pets that are receiving a quick consultation. 7. Enter relevant information in the Arrival Summary form and then push the OK button. 8. 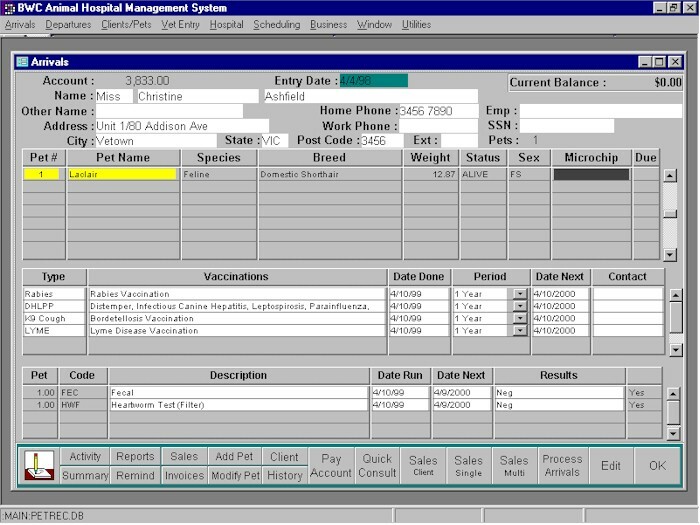 Enter relevant information in the Data Entry for Billables form and push the FINISH button. 9. Enter relevant information in the Final Billing form. 10. Push the OK or OK RECEIPT (to print receipt, if desired) button when finished. 2. Push the PAY ACCOUNT button located at the bottom, middle of the screen. 3. Confirm information on the POA Client screen and push the CONFIRM button. 4. Enter relevant information in the Payments On Account form. 5. Push the CLOSE button when finished. 6. Push the OK button on the Arrivals (particular client) screen to return to the Arrivals (all clients) screen. Search for the client (last name or last name first name). Once found, you can double-click on the account number (yellow field) to see pets and client information. Additional searches are available for Pet name, Address, Account number, Phone number. Press the PROCESS ARRIVALS button to select a Pet for attendance at the Clinic. Press the OK button to continue with the Arrivals process. The Arrivals Summary form will appear, showing the pet(s) arriving. Enter the arrival details by inputting each field's information, then pressing the TAB key to advance to the next field. Press the OK button when all necessary information has been entered. The pet(s) are now in the Arrivals, and are considered residing in the clinic until departures are performed.